The first teaser trailer for the upcoming Arrowverse crossover event Elseworlds is here. Production recently wrapped on the three-night DC spectacular, which promises to be perhaps the most important crossover event in this universe to date. Not only are a lot of new, important characters and locations set to be introduced but, as we see in this first teaser, the worlds of our various heroes are going to be turned upside down. 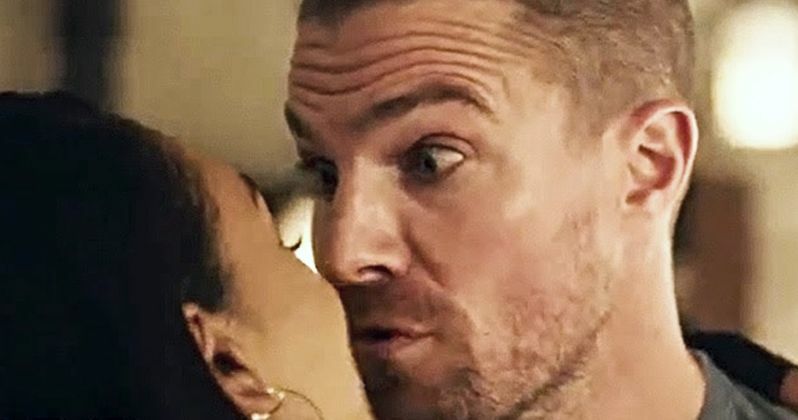 As had been teased in various behind-the-scenes photos from Arrow star Stephen Amell, as well as in the official Elseworlds poster, Barry Allen and Oliver Queen, through some live-action comic book craziness, are going to literally swap identities. As we see in this brief teaser, Amell isn't just taking over as The Flash, he has literally become Barry Allen. Iris West (Candice Patton) isn't phased when it's the man we've come to know as Oliver Queen in her bed and in her home instead of our usual Barry. It doesn't do much in the way of explaining how this was made possible, but it should be more than enough to get fans on board with the wild ride heading our way. We can only assume that the network is going to release a similar teaser showing us what Grant Gustin is up to in Oliver Queen's shoes. Beyond that, Supergirl is the other show participating in this year's crossover event, with the Legends of Tomorrow sitting this one out. As disappointing as that may be on some level, it could help prevent things from getting too muddy and allow for some actual character development, since they won't be squeezing in a handful of additional characters who need some screen time. Outside the core trio of heroes, Tyler Hoechlin will return as Superman during the crossover and, thanks to a previously revealed photo, we also know he's going to be rocking the famous black suit that was supposed to be in Justice League. Lois Lane, as portrayed by Elizabeth Tulloch, will also make her debut, as will Ruby Rose as Batwoman. It's expected this will be a way to springboard the character into her own series. The event will also serve as the Arrowverse's introduction to Gotham City. So yeah, a whole lot is going on. Even for those DC fans who don't keep up with this universe on a week-to-week basis, it's starting to seem like this is going to be a must watch, with the potential to be a whole lot of fun. Elseworlds kicks off on Sunday, December 9, with The Flash, continuing on Monday, December 10, with Arrow, before reaching its conclusion on Tuesday, December 11, with Supergirl. With the event just around the corner, we should expect to see a full-length trailer any day now, which we'll be sure to bring your way as soon as it's made available. In the meantime, be sure to check out the first teaser from The CW below.